Century Cycles Blog: Election Day Sale! Wear your "I Voted" sticker and get 10% OFF All Merchandise Tuesday, November 8 - ONE DAY ONLY! Election Day Sale! Wear your "I Voted" sticker and get 10% OFF All Merchandise Tuesday, November 8 - ONE DAY ONLY! On Tuesday, November 8, 2016, what feels like the longest election season in history will finally come to a close. We'd like to reward everyone who does their patriotic duty by voting with a special one-day only SALE! 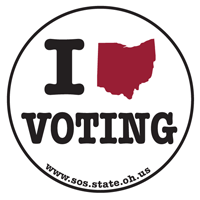 Wear your "I (Ohio Heart) VOTING" sticker and get 10% OFF all in-stock merchandise! Applies to items already on sale, including bicycles! Offer valid on Tuesday, November 8, 2016 ONLY. Discount not available on labor charges or Gift Cards.